The problem? That number was actually Trump’s “unfavorable” rating. Meanwhile, Trump has not removed or tweeted a correction to the graphic he posted as of this writing. The graphic aired April 10 during “Lou Dobbs Tonight.” Fox Business and its sister network both issued on air corrections Thursday. Fox Business Network has now issued an on-air correction for the incorrect poll graphic the president screenshotted in a tweet this morning. 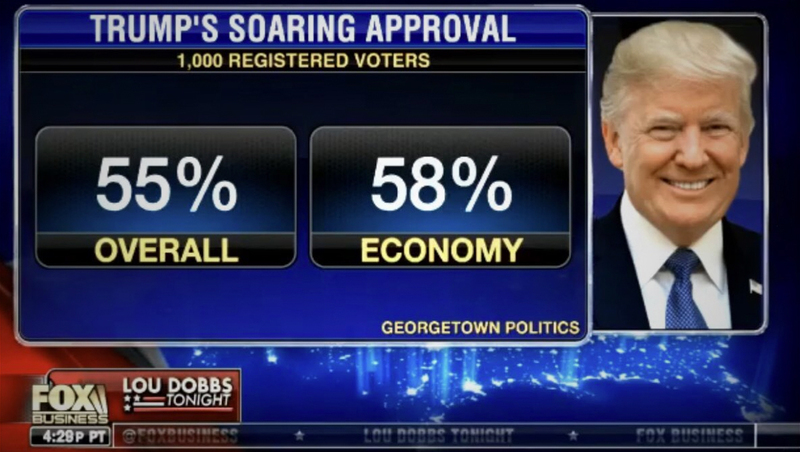 Under the headline “Trump’s soaring approval,” the graphic was (attempting) to cite data from a Georgetown University poll on Trump’s favorability and approval ratings overall and with the economy. In most polling, approval ratings are tied to the specific job performance of an elected official — while favorability ranks the overall impression of the person. Dobbs, who is vocal Trump supporter and reportedly speaks on the phone with Trump, trumpeted the graphic’s erroneous claim that 55% of those polled “approve” of Trump. That 55% figure is actually the “unfavorable” rating of Trump. Fox did manage to get the 58% approval rating of Trump’s handling of the economy right in the graphic. If the incorrect reporting wasn’t enough, Dobbs and both Fox channels got schooled by one of their own contributors, Mo Elleithee. Elleithee, who is the Georgetown University director of politics and a Fox contributor, tweeted early Thursday morning that the 55% figure is actually the “unfavorable” rating — with 40% giving Trump a “favorable” rating. Meanwhile, the same poll showed 43% overall approval and 52% overall disapproval. Because of the difference between “job approval” and “favorability,” Fox’s graphic was actually wrong on two counts — not only was the 55% figure not part of the “approval” rating as the header labeled it — but it also flipped the positive and negative data. It was also pointed out that one of Fox’s on air corrections acknowledged an error in a “graphic” but did not mention Dobbs’ discussion of the data in the graphic, which reflected the same errors. Euronews is headquarted in Lyon, France, with significant operations in Athens, Brussels, Budapest, Doha, Dubai, Istanbul, London, Paris and Washington D.C.